Three young women made their first profession of vows as Little Sisters of the Poor at the United States Novitiate in Queens Village, NY. Bishop David Zubik of Pittsburgh was the main celebrant and homilist.Sr. Amy Catherine Joseph who met the Little Sisters as a nursing student in Evansville, Indiana, will join the home in Philadelphia. 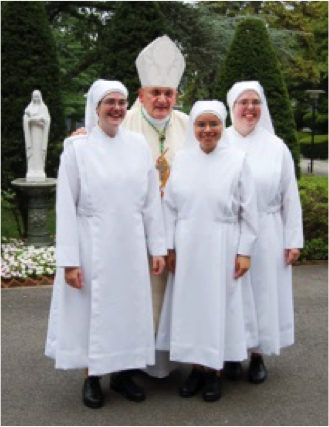 Sr. Elisabeth de l’Eucharistie from Quebec has been assigned to the home in Dinan, France. Sr. Maria Carmen Therese who grew up in the Philadelphia area will be traveling to the home in Washington D.C.
For more information on the stages of formation, please visit our U.S. site by clicking here.